Not too long ago, all you can see in this downtown neighborhood were the low-slung buildings in the foreground. That was before the boom that added a number of high-rise residences. From left to right, you have “Spring”, a condo, “The Bowie” and “The Monarch”, both of which are high-end rental apartments. Spring and The Monarch were built about eight years ago. It wasn’t until 2015, when The Bowie completion created this balanced three tower visual. Behind me is the completed Seaholm Power Plant redevelopment. The relatively new to Austin Trader Joe’s supermarket chain gives this a true neighborhood feel. I saw a lot of young professionals, buying a small sack of food, and walking back to any number of new residences in this area. It’s the kind of dynamic you wouldn’t have expected in Austin, just a short time ago. I shot this about a week and half ago, during my quiet Sunday photowalk. 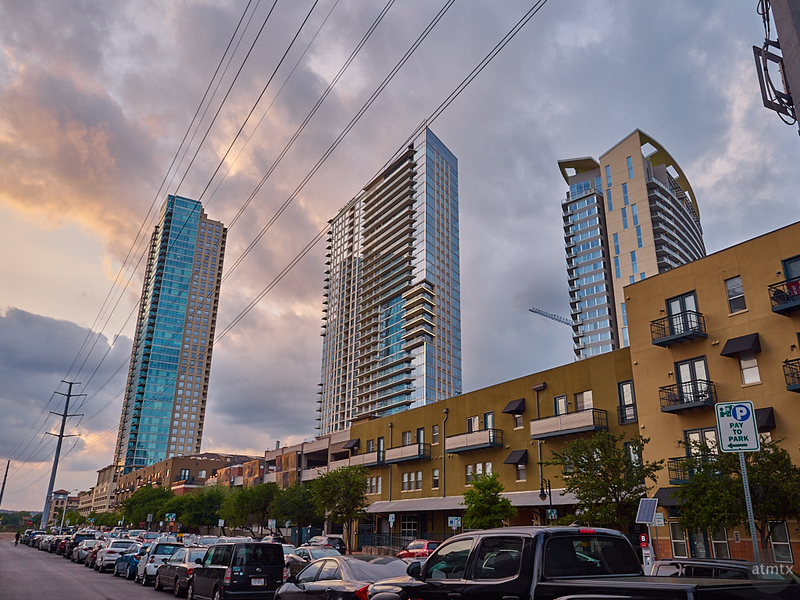 The sunset didn’t quite hit spectacular but the wide-angle and dramatic (for Austin) towers, creates an angle I like. While I generally dislike power lines, these only distract modestly but give the benefit of strong diagonal leading lines.